Where has the year gone? I mean, seriously! I feel like I was just sweating to death in the dog days of summer. But here we are, the air is chilly, the leaves have turned, we've even transitioned from all things pumpkin-spice to a peppermint paradise. I don't mind the change though, it actually reminds me of some of the best memories. I'm not talking about Thanksgiving dinners, holiday specials, or resolutions never fulfilled. Sure I have fond memories of holidays past, but that's for another time. Football is today and everyday until the SUPER BOWL. 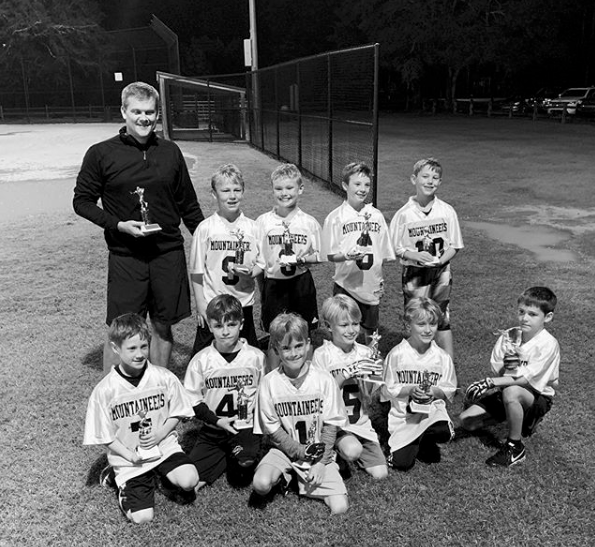 I grew up in a family that L-O-V-E-S football! College, professional, tackle, flag, you name it, we love it. There is just something about the sport that brings everyone to the living room, chips and dip in hand. TV blaring, yelling from the sofa, refuting the calls because obviously we saw it better than the refs. And this passion has only continued down the bloodline. When looking over his latest report card, I noticed that he really needs to sharpen his focus on reading for meaning. He's amazing at grabbing literal text and committing it to memory, but there are still gaps in his ability to chunk pieces of information together and draw conclusions. Oh inferential, we will master you, yet! So what does a teacher do to help her son? Well duh, create a passage that he simply cannot refuse. ...and here we have it, friends, a football-themed text with all things comprehension. 2 page passage comes in color and black/white and is easily accessible for students in grades 2nd-4th. 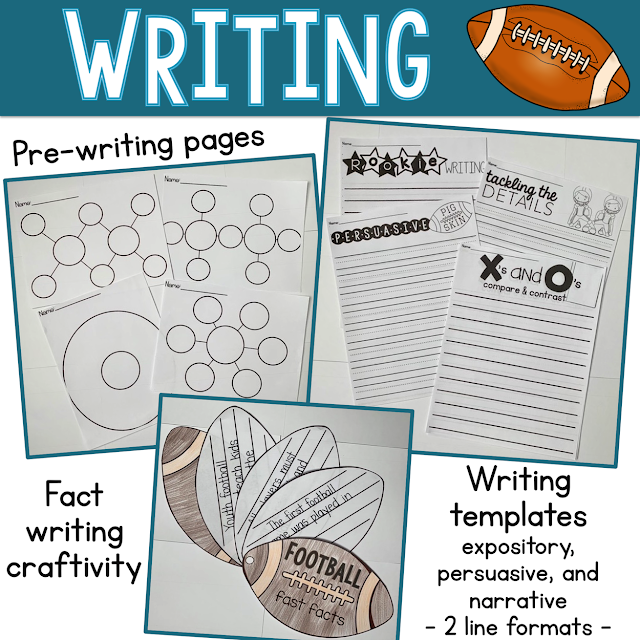 And writing is a MUST, because let's be honest, EVERYONE could use writing practice and it can be a wonderful tool for assessing student knowledge of the topic or skill (i.e. determining facts, writing persuasively, comparing and contrasting). 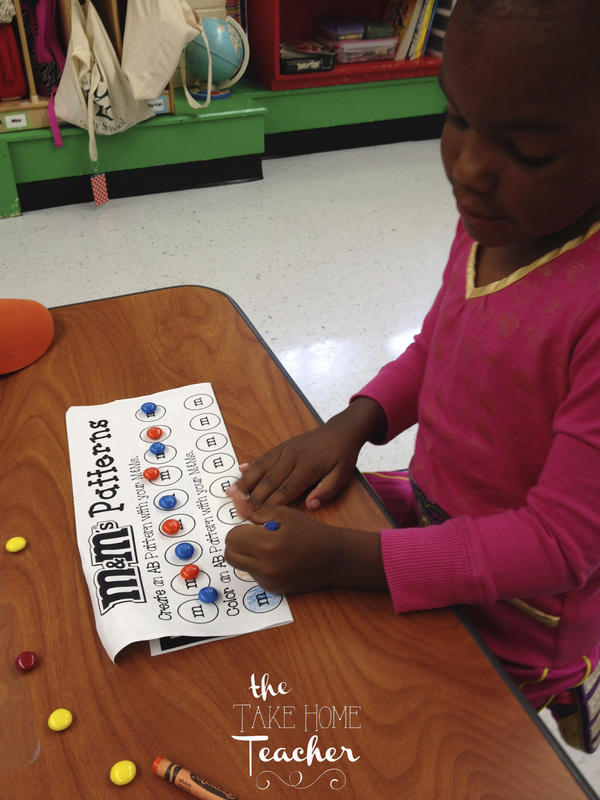 Games are wonderful tools for comprehension! I can ask questions until I'm blue in the face, but my students always respond better when the element of F-U-N (and a lil' bit of competition) is involved. I, purposefully, designed some of the vocab, true/false, and reading comprehension cards to require deeper thinking - is the sentence 100% true or does 1 word make it false? 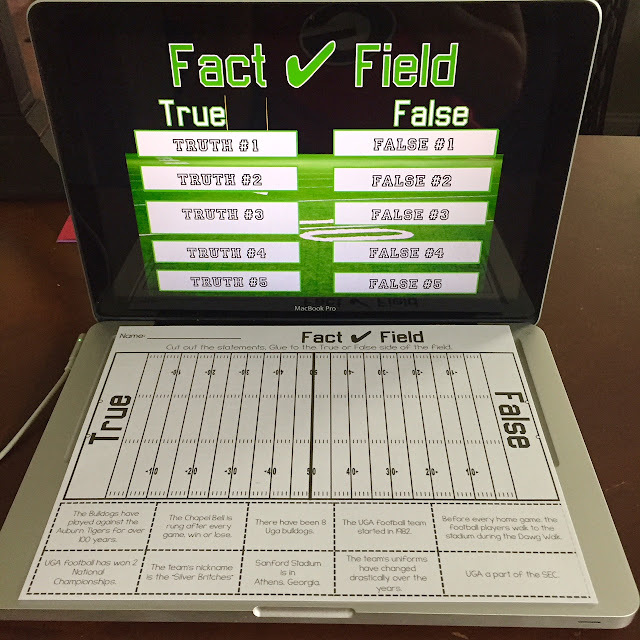 Could the word be associated with one football definition or be applied to more than one? Does the text explicitly state the answer or are you inferring meaning by collecting information from several sentences? These were perfect for helping my son analyze information (reading text carefully) to determine validty and draw conclusions! 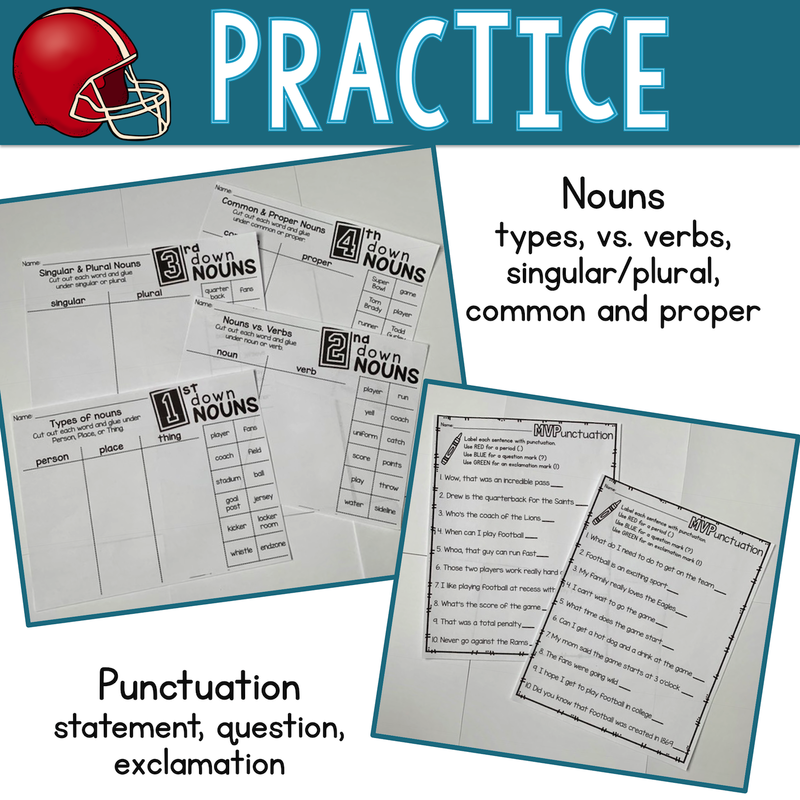 Nouns and punctuation practice are always good to have on hand. It still baffles me how many students forget a period at the end of their sentences or ask me what a noun is. Guys c'mon, we're in 3rd grade!!! 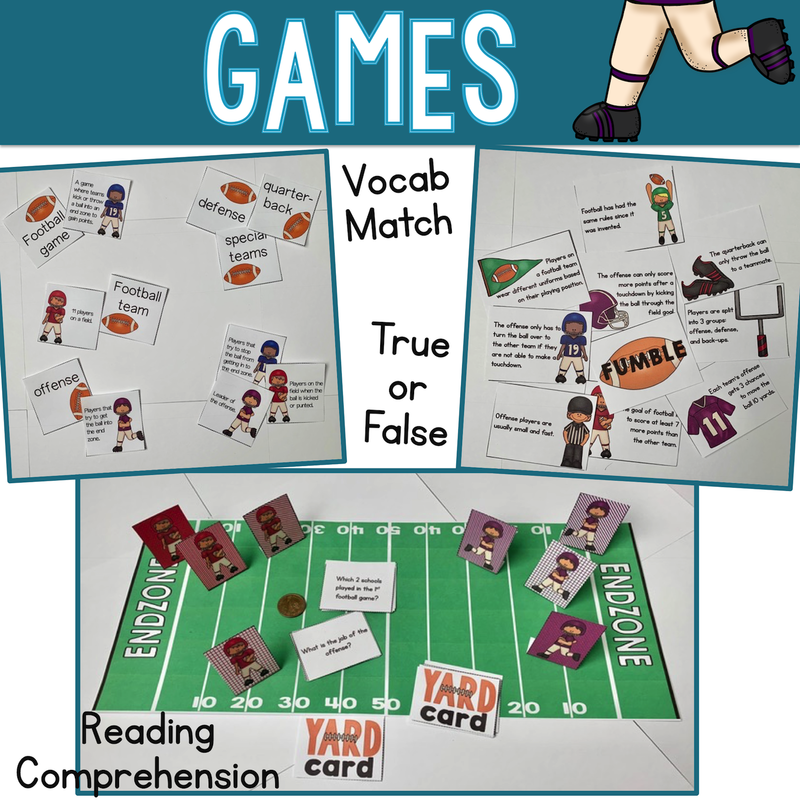 Will your students enjoy reading this text and interacting with these games? "Mom, are you done making it yet?" "Can I read/play it now?" 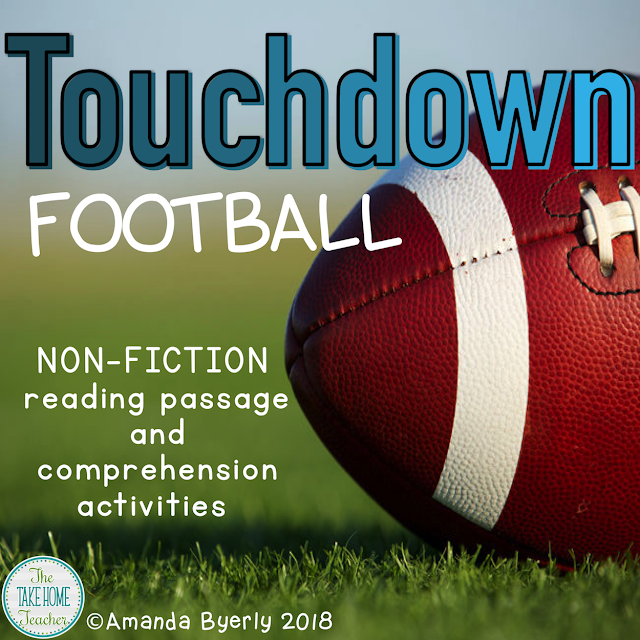 I hope this text and these activities help your students TACKLE reading non-fiction text and gain YARDS of comprehension in a fun and engaging way. an author in his profession. This ELA gal is L-U-C-K-Y! Want to know a lil' secret though? I have another man crush. A double whammy kinda guy. He's an author; an illustrator too. And he writes to my profession...KIDS! You probably know him already. He's a big deal. But the MAIN reason I think Mr. Jeffers is just superb is because his books speak to children in a way that makes them think critically, even when they don't realize they are. I went straight to Teachers Pay Teachers and didn't find much. Sidenote: That has drastically changed; when searching again last year, I was able to find great products revolving around this book. I knew my students needed something. 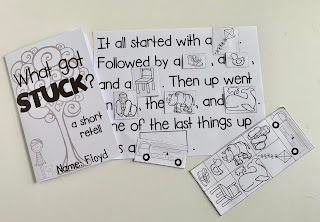 Something fun to drive home the comprehension piece, those ideas we discussed while/after reading the book, those pieces of understanding that could be taken directly from the text and those that needed to be inferred. 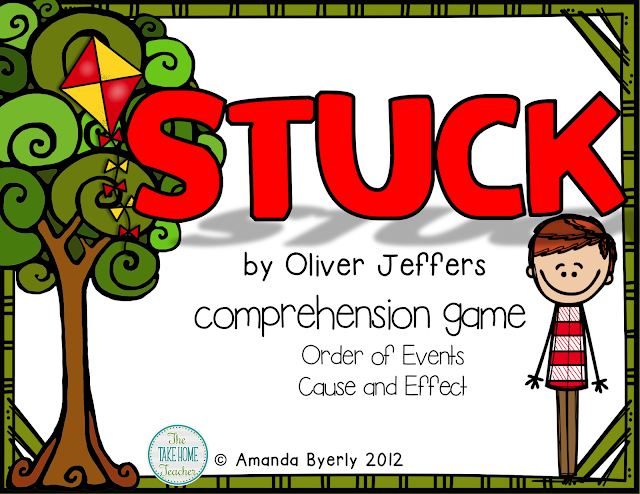 STUCK Comprehension Game was born. 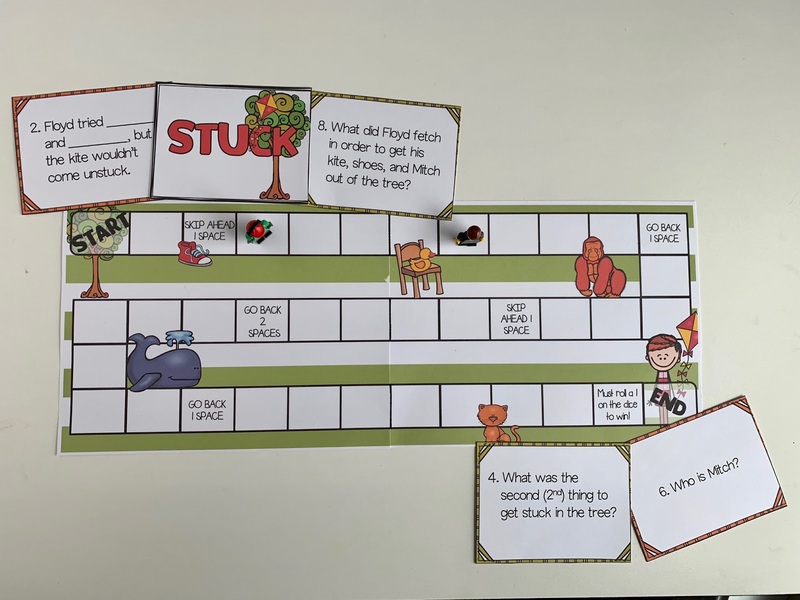 An interactive game focused on cause and effect and order of events through explicit and inferential questioning of the text. It was a hit! A HUGE hit! Not just in my classroom, but in my friends' classrooms and with my own son (once he hit elementary school). 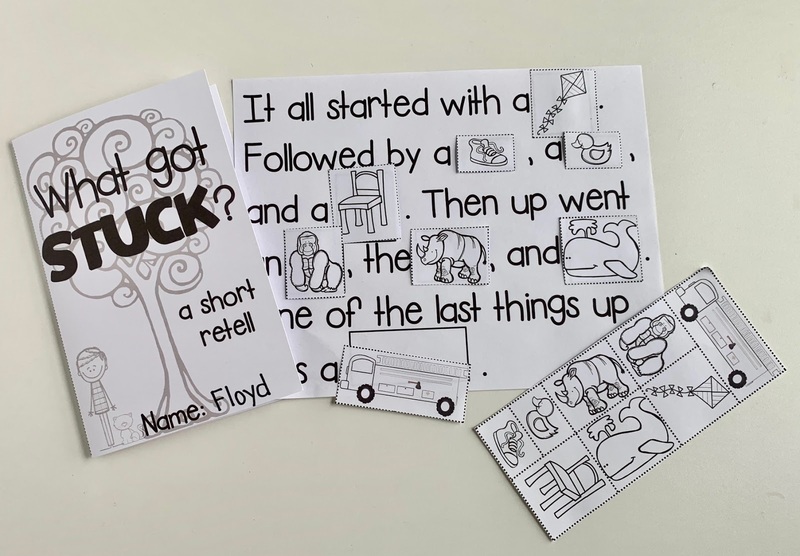 It went on Teachers Pay Teachers and it was a hit there too. Years later and awareness of copyright laws came about. I couldn't ignore the fact that my original product was infringing on my man-crush's creative property (I had copied unsecured images from Google). I couldn't do that...I couldn't "steal" from another person, a creative person, a person who I admired. And let's be honest, as a teacher, it's my job to be a role model for kids...stealing in any form is WRONG! So I had to fix it...and fast...before my conscience ate away at me or worse, Oliver (or most likely, his people) called! That is NOT the way I want to meet this man. 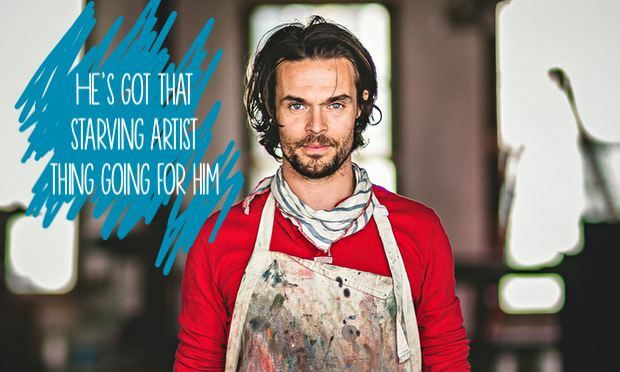 One day, I want to look him in the eye and tell him how much I appreciate his work without that gnawing feeling that I was taking his artwork and making money on it. NOT COOL! I got to work and made an overhaul of the product. New images (with credit given to artists) and improved game board. And to make it worth the redownload for my original purchasers, I added a rebus reader. SAME PRICE...no bump. And my heart rests in knowing that I've done the right thing. With my love of STUCK reworked and completed, I knew I had another project to attack. 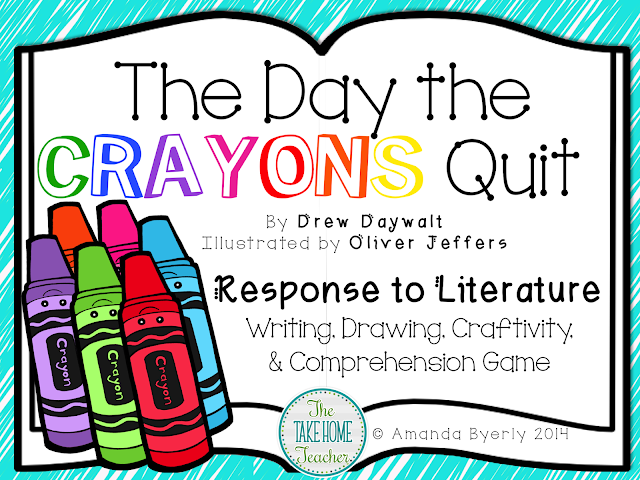 NEXT UP: My love for Oliver Jeffers' talent was cultivated when I first opened The Day the Crayons Quit by Drew Daywalt. I couldn't get enough of the text and the amazing illustrations. 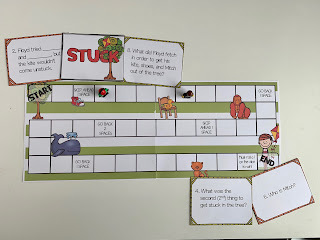 I created this Response to Literature/Comprehension Game for TDTCQ; now that my creative juices are following again, I knew I needed to bring fresh life to this creation. * No copyright infringements in original version, just wanted to give it a facelift. So go check out the updated version...more writing format options, added thinking maps, & rearranged graphics. Same great craftivity and game! Most educators are thinking about field trips to the pumpkin patch, 1st quarter report cards, students coming off of candy-comas. 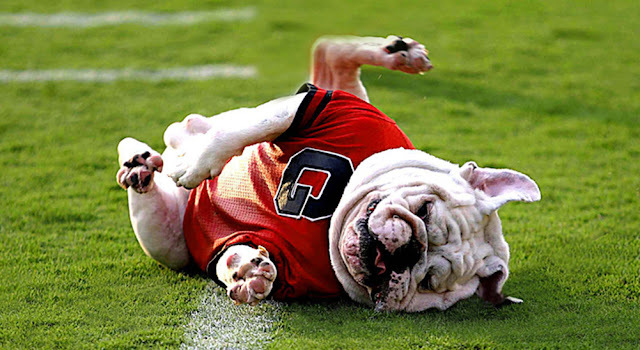 I'm utterly and completely obsessed with college football. Like ESPN's College Game Day broadcast is on the living room TV at promptly 9am each Saturday morning. I love the analytics, the back stories, the predictions, the signs - you name it, I like it. But I don't really care about most college teams. 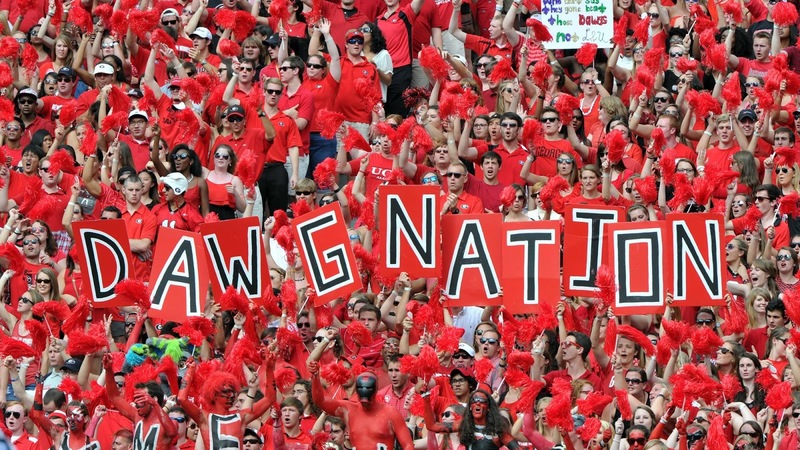 I care about SEC teams because I'm a born and raised Southern girl. And I only truly care about one team...the BEST team in my humble opinion. To be honest, I don't think I ever had a choice. My dad loves UGA football. He analyzes every play of every game. He scrutinizes the scouting. He picks a part pretty much every aspect of the team. He knows who's coming and who's going. It's impressive, actually. So why does this even matter? 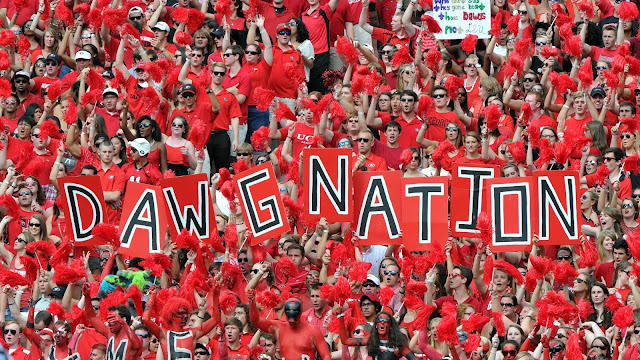 Well, now you know my football-loving heart and what I'm about to show you will make sense...especially if you are in the DAWG Nation too. My son was a struggling reader. He wasn't making the progress that I always thought he would...he's a reading teacher's kid for goodness sakes. He hated the leveled readers and complained they were "boring". Eventually, I just let him pick out whatever books he wanted. I needed to let go of reading levels and let him find books that spoke to his interests. Fast forward and my boy is in 3rd grade now. He's a good reader; he reads without complaining. He reads a pretty good assortment of genres. He still works on improving his accuracy and fluency, but his comprehension is sky high. 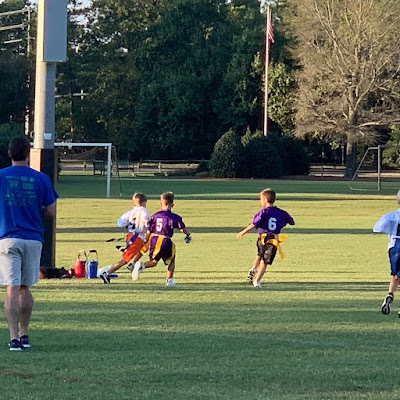 Watching my boy struggle was heart wrenching, but light came when he was able to dive into topics that sparked his interest. One of his favorites is FOOTBALL; my boy has adopted my love of the Bulldogs. He could read about specific quarterbacks, teams, heck even fantasy football. If it involves the pigskin, he's in. So HUNKER DOWN is a gift of love to my boy. Created and developed for him and those like him. The kiddos that love football, specifically UGA football. 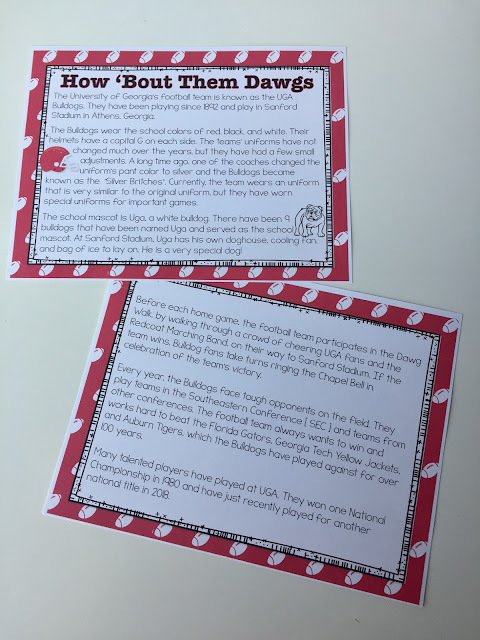 Activities center around an included non-fiction reading passage that details the history of UGA football, the uniforms, Uga the bulldog mascot, traditions, and the infamous SEC opponents. 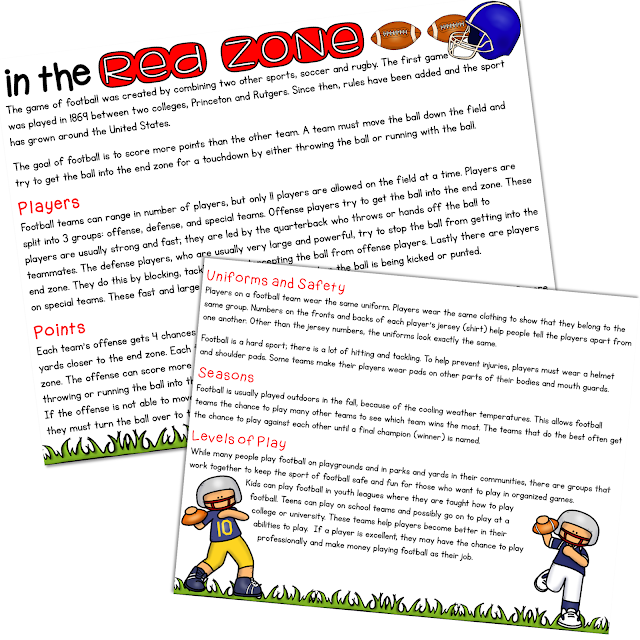 The reading passage is most suited for 1st-3rd grade students who can read or be read to and understand the content of the text. 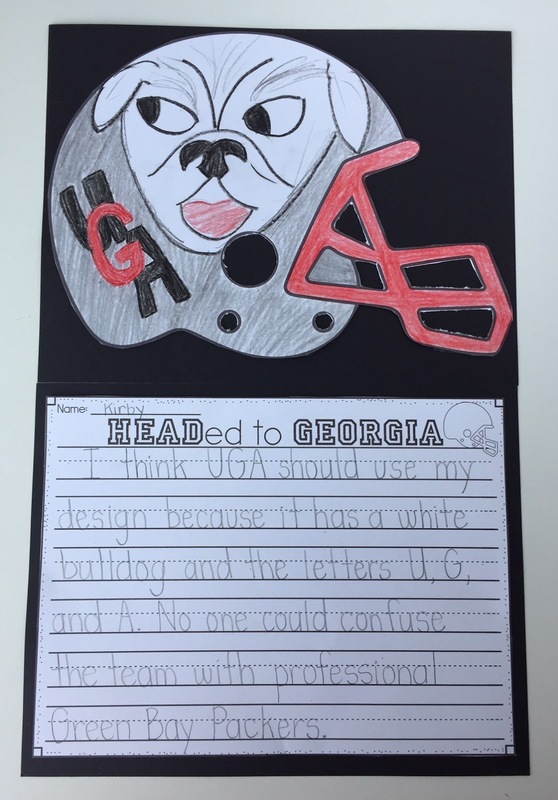 HEADed to GEORGIA gives kids the chance to use their art skills to redesign the team's helmet and use their persuasive or descriptive skills to explain their rendering. 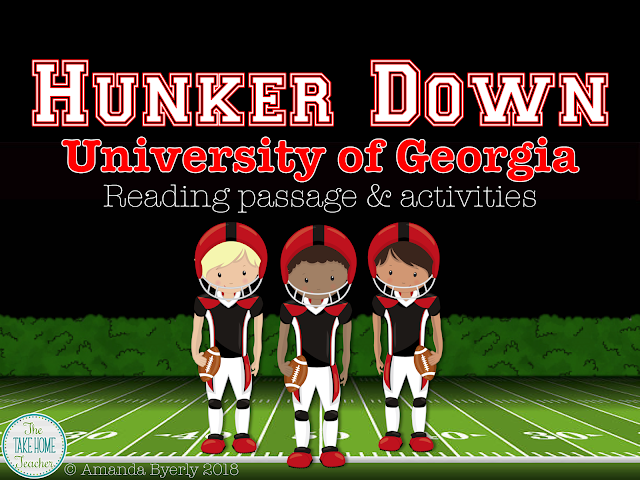 While, DAWG details offers kids the chance to put their gained knowledge to use in an expository writing. Fact Check Field is a True/False PPT slide that you can use in a game or as a review for kids after they've completed the cut & paste sheet. 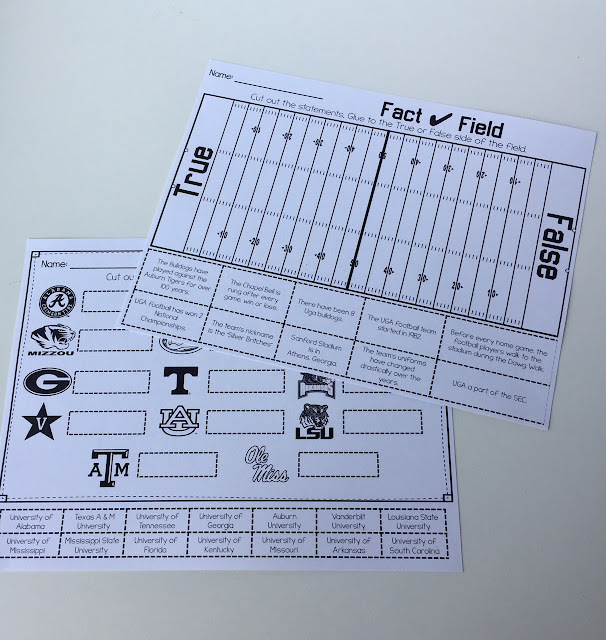 SEC Logo Match gives students the chance to use context clues or prior knowledge (PPT slide included too). 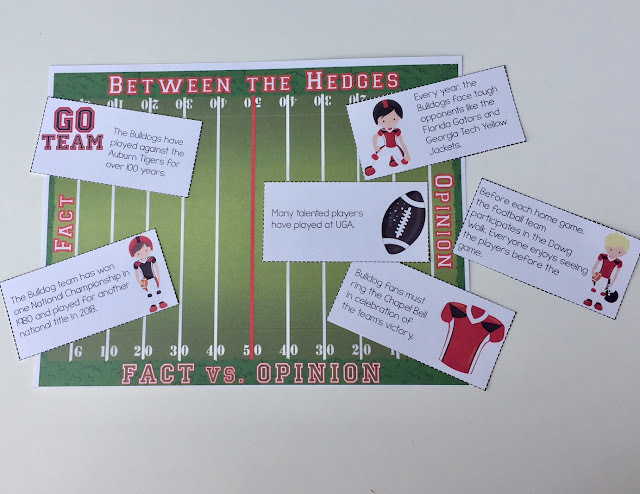 Between the Hedges is a Fact or Opinion game that requires students to back-up their beliefs. 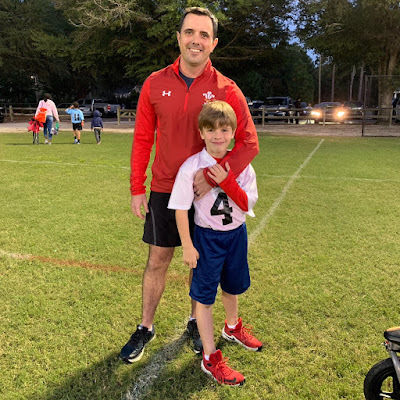 I think I covered all my bases (wrong sport) - the skills I wanted to cover with my boy. He thought his opinion was always fact...sometimes he still does. If he can back it up, it must be believed by everyone. Oh to be 8! Meanwhile, I'm wrecked from pouring over these activities for hours. The last several years have been...well, BUSY. 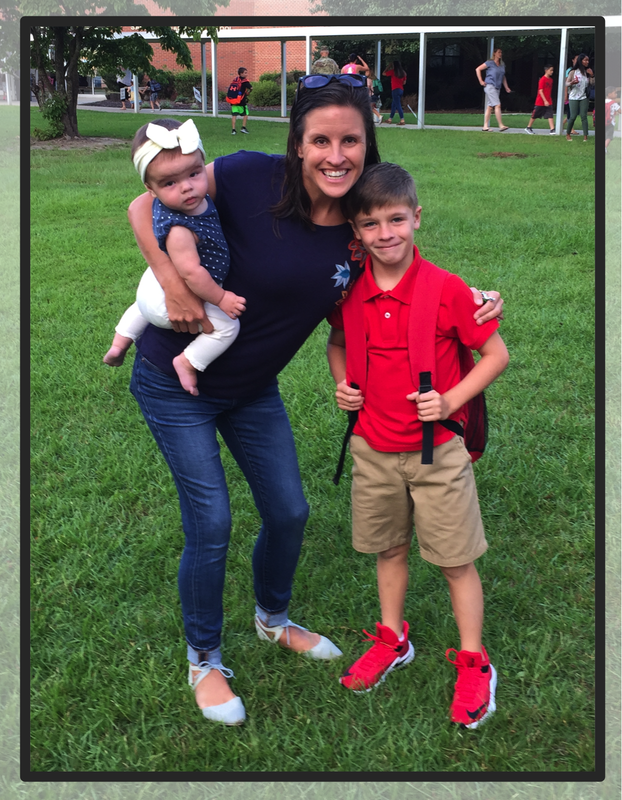 In a nutshell, I took some serious time away from creating to focus on being a teacher, a grade-level leader, a mother to a struggling reader, a wife to a stressed-out spouse, a pregnant lady moving across the country, and a supportive daughter. Those roles didn't define everything about me, but they took a lot out of me. They didn't leave much room for creativity. And now? 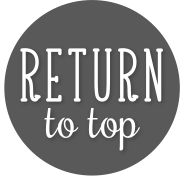 Now, I'm back. I've stepped out of the classroom to focus on being a mom to a baby, a time that I treasure as these little moments are fleeting. I get to be the ever-present being in my 3rd grader's life and pour into the humans that surround me. It's stressful at times, sure, but it's my life at this moment. And it gives me the opportunity to create without feeling bad that someone/something else isn't getting my best. I create because I care, and because it fulfills me. 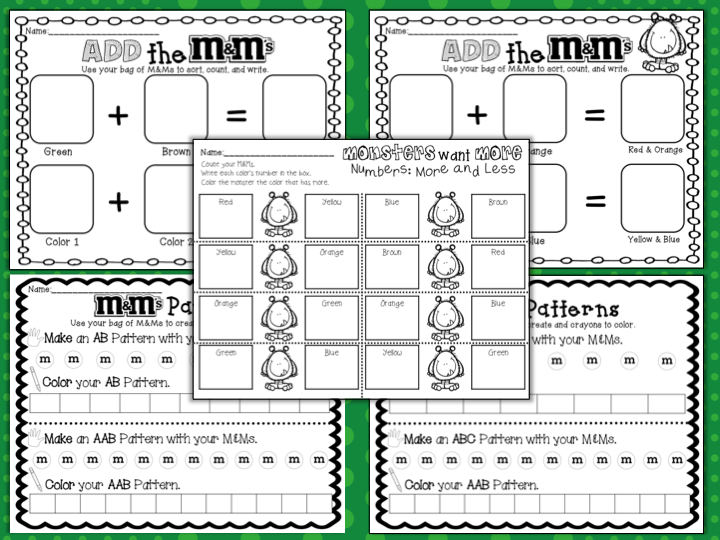 It helps me take all those little ideas that have been floating around in my head, you know those ideas that pop up in the middle of a lesson and you think "I should do that. I wish that existed. It would be so awesome if..., etc"; turn them into actual tangible things. 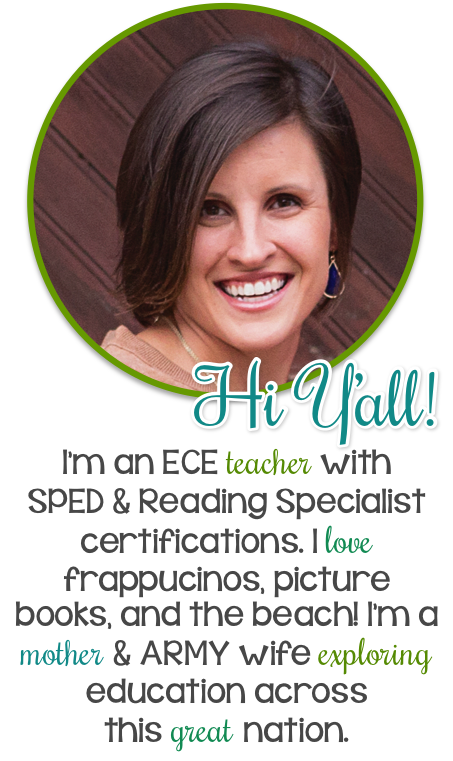 They are the resources that would have saved me tons of time or helped my students better understand. They are the activities that would have spoken to my students' interests while giving me the insight to their learning. All the ideas that just sat in my head (and in my journal), waiting for me to turn on the computer and create. So here I am. Back at the computer. CREATING! Doing what makes me smile and knowing that one day, I'll put these creations to use when I go back to the classroom. I won't have to wonder...they'll be there, ready. Back in July, I was super fortunate to hear about a fabulous promotion being sponsored by A+ Images. 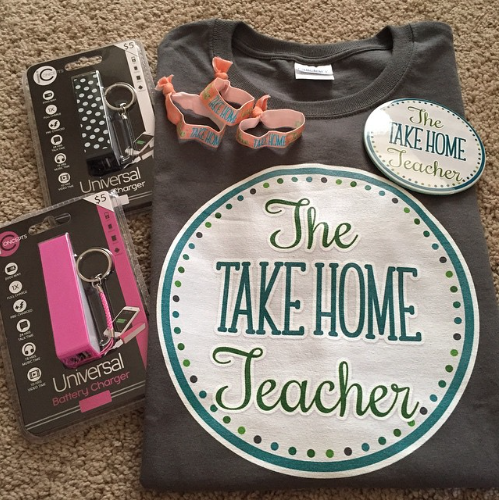 They were giving away free t-shirts to teacher bloggers. Yep, FREE! And the best part? I got to design my t-shirt...any color, images, fonts I wanted. Complete creative freedom! And at a price tag of $0, who could pass that up? NOT ME! I logged on, created, ordered, and had my shirt in less than 2 weeks! Just in time for my BIG trip to Las Vegas for the TPT Conference. And several other bloggers took advantage of A+ Images awesome promo. It was super helpful to see t-shirts with logos rather than squinting at tiny logos on name badges. You could easily spot my logo from across the room. (Tara from Tiny Minds at Work, me, Kristen from Teeny Tiny Teacher, and Hadar from Miss Kindergarten) Go follow A+ Images on INSTAGRAM to stay up to date on future promotions. Trust me, you won't want to miss out! Fall is in full swing and maybe your planning could use a little perk up! 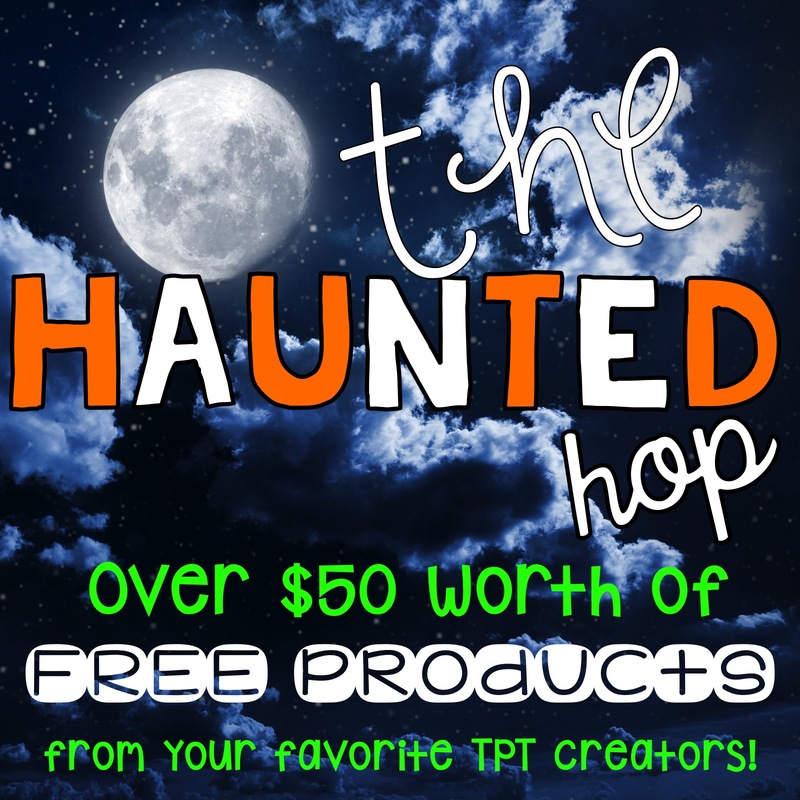 Well lucky for you, some of your favorite TpT sellers have gotten together to make your Fall a little bit easier to plan with the Haunted Halloween Hop! Are you ready to put all that Halloween candy to a good use? I was, am, and will be. 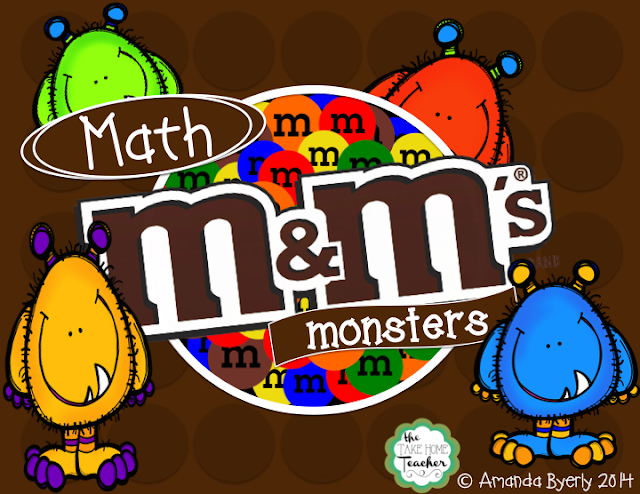 That's why I created Math M&M Monsters! 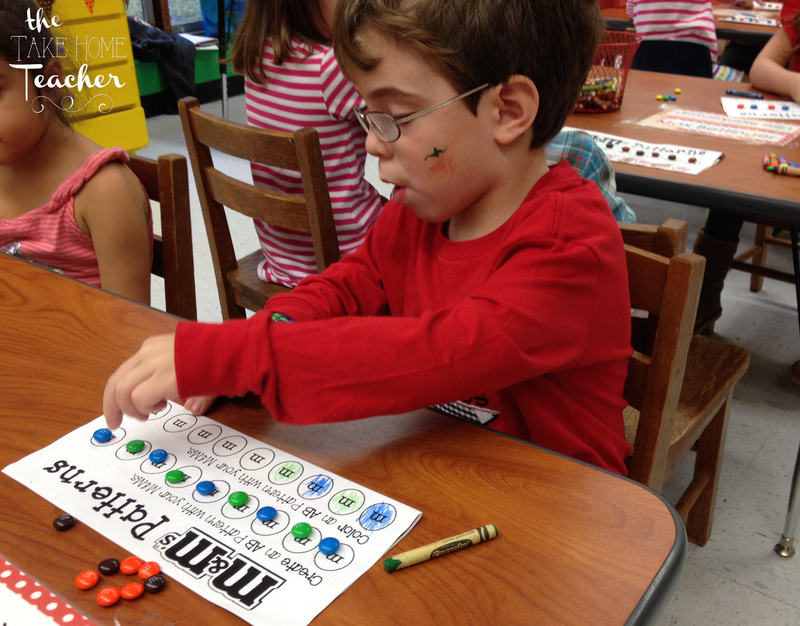 With a snack size M&M candy bag (Halloween portion), students sort and graph their individual bags. Need some more fun with those candy pieces? 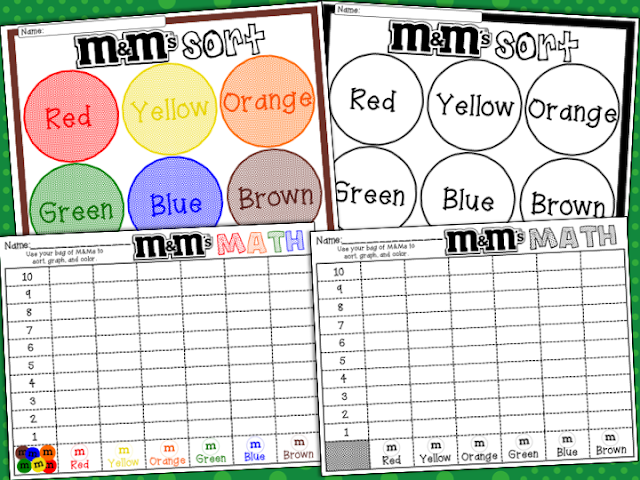 Have your kiddos add groups, compare numbers, and/or create patterns! Head on over and FOLLOW me in my Teachers Pay Teachers store. DON'T FORGET to write down my Secret Word. Remember to view my store from a computer so you can see my banner! HOP ENDS ON OCTOBER 25TH! 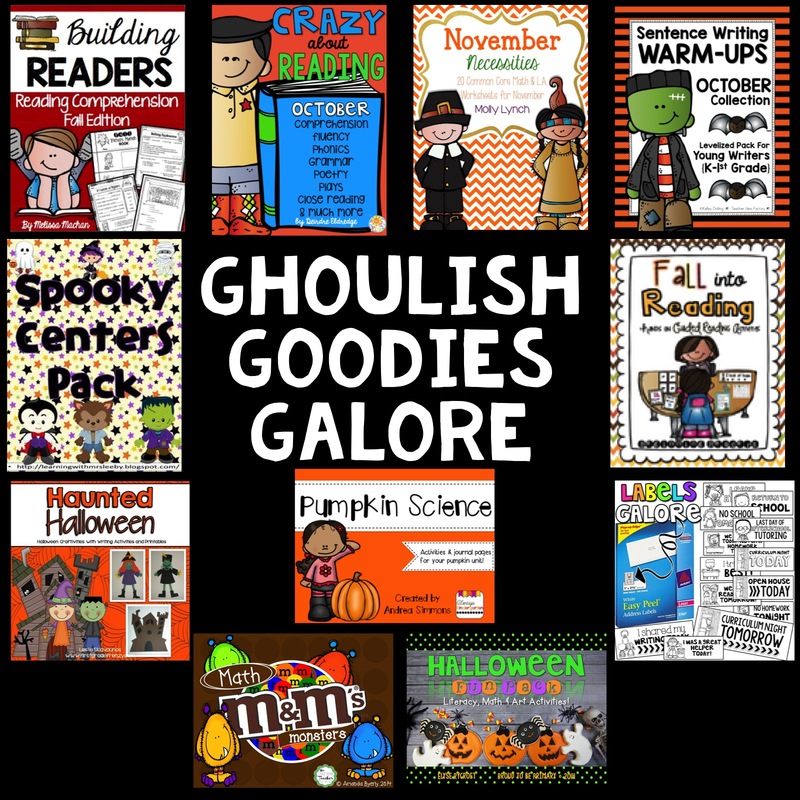 Now, head on over to visit Melissa over at First Grade Smiles to see the amazing goody she's sharing! I think chapter 5 starts off with a great quote "Students must have initiative; they should not be mere imitators. They must learn to think and act for themselves-and be free." - Cesar Chavez That's a statement I can get behind! I want my kiddos to be independent-thinkers and problem-solvers, not robots that require direction from me in every situation or scenario. 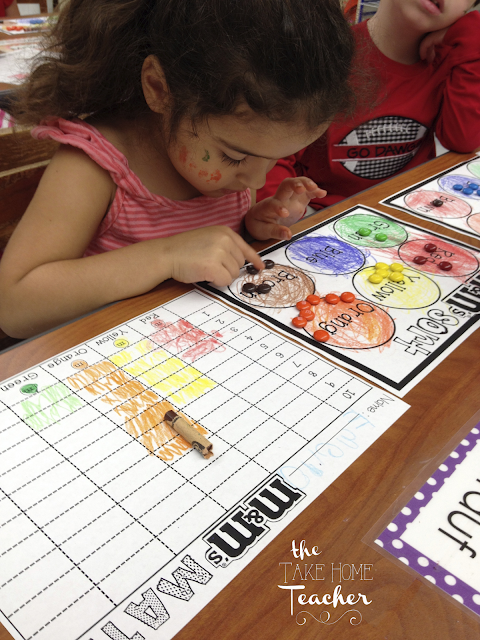 There are times and places where those littles can step up and figure out what needs to be done and how to do it. Here's the catch: I don't think they need to get a parade every time they take initiative to do something that needs to be done. Put away the ticker-tape and let's teach them that pitching-in is part of being a member of a larger community. 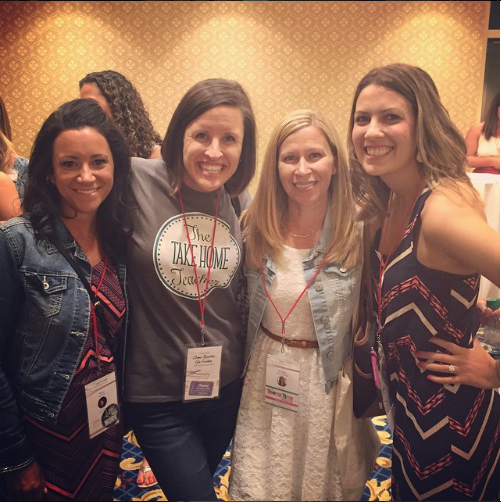 A community that needs everyone to participate in order for the classroom to be successful. And get this! Students WANT to feel like their role is important! They want to feel needed and relied upon...you know it's true! I love how Paul lays out how he structures his classroom, so that students CAN have responsibility. Everything from cleaning up materials to time-keepers. He details what jobs are assigned and which are left to collaborative responsibilities - everyone has the opportunity to step-up to do what needs to be done and remind others to pitch-in. He helps them to see when those chances for participation are missed, how to share the responsibility (not hogging the duties), and when a better way would be appropriate. 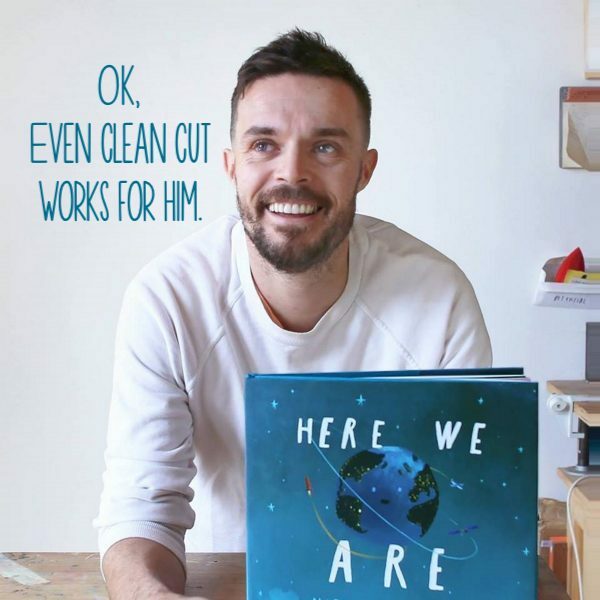 Paul doesn't leave his classroom up to chance, he teaches his students how to help ensure that the environment is fully functional, so he can be the best teacher and they can be the best students possible. What I truly LOVE about this concept is that it transfers far beyond the classroom. Teaching students to be active participants in the daily running of classroom will only help them become better citizens in the greater community. I can't wait to catch up to chapter 6 on Active Learning. I'll post soon!